Alright, I'm new here to the forums, also pretty new to owning a Ranger. I bought mine about 6 months ago. It worked great, except as time went on, it got harder and harder to get into gear. I did a bit of research and figured maybe it was the slave, as apparently they tend to go here and there. So, being off in the winter months, I decided I'd do it myself. Dropped the trans, easy enough. Ordered a new slave cylinder, and a new clutch disc. Installed both, bam, easy enough, put it all back together, sure, no problem. Then, I started the bleeding process. I bled and I bled, to no avail. I have a soft clutch about 7/8ths of the way down, after that it feels nice and solid. It springs back easily enough. I figured screw it, I'll just put in a new Master Cylinder while I'm at it too. Bought a new master, bench bled it, thoroughly, (rock hard to push in, won't move more than an eight if that even). After installing the new master, I connected the quick connect line back to the slave, cracked the bleeder, and kept the reservoir full. Let it go through about 3-4 reservoirs. Closed the bleeder, and still, same thing, clutch goes down pretty soft for the first 7/8th, and gets solid after that. I looked into the hole in the bell housing, and I got someone to press the clutch. I can't see any leaks in there, I'm assuming if my slave had a leak it would **** out fluid right? Also, the throwout bearing is right up against the fingers on the pressure plate, which Im assuming it should be, correct? Is there any part during the clutch install that I could have messed up on, that would cause this symptom? Thanks! a. Can you describe exactly, the process you followed to bled the clutch? b. are there some linkage type adjustments on either end you may be able to make to get the clutch to engage sooner? A. 1st, I remove the master cylinder from the firewall with the reservoir and lines attached. I hang it up somewhere, and angle the mc upwards. Then proceed to move the pushrod in and out till it moves no more than an eight of inch. Reinstall in truck. Before connected line to slave cylinder, I push on the clutch pedal to make sure it's still rock solid. It is. I then connect slave cylinder line. Open bleeder valve, and gravity bleed slave, going through 3-4 reservoirs. While it's still pouring out fluid, I tighten bleed screw. Should be bled right? I step on clutch, and its soft 7/8th down, but not terribly soft, just a bit, and then the last little bit it really pushes down pretty hard. B. I wouldn't know where any linkages are! You haven't really mentioned whether the truck actually drives, so is this issue preventing the truck from driving, or is it just something that is an annoyance to you? 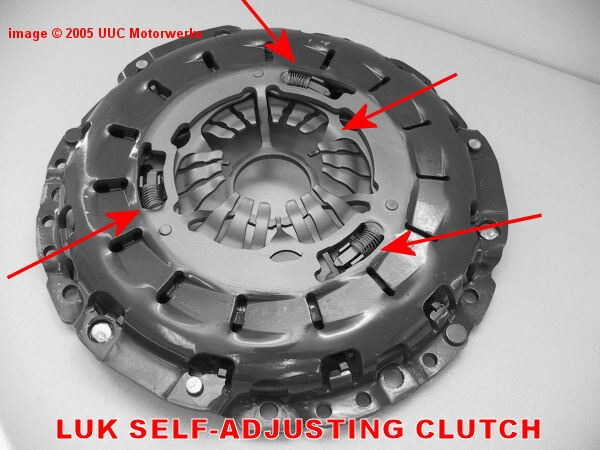 Are you comparing the feel of the clutch to how your truck felt before the new clutch, or are you comparing how the clutch feels to another vehicle? 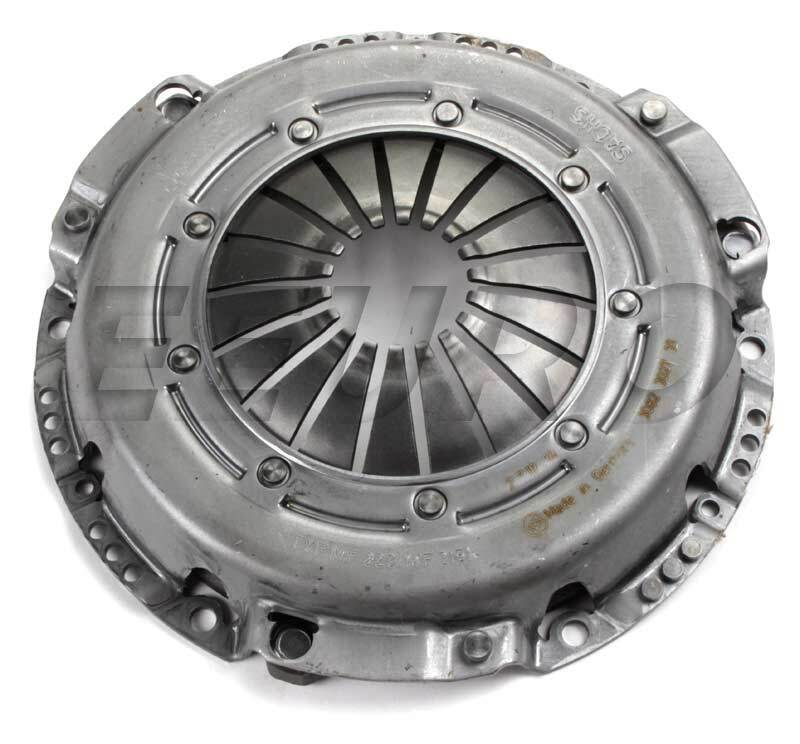 When you look in the inspection hole, how does the clutch engagement look? Does it look like the throwout bearing puts even pressure on the fingers of the pressure plate? Also, did you replace the o-ring on the slave side of the hydraulic line? It is preventing the truck from driving. When turned off I can go thru the gears no problem. I'm comparing the feel to how it felt before. The ONLY thing I replaced in the trans other then the slave, was the ckutch disc. And yes, I put a new o-ring there. Rangers often used a SAC(self adjusting clutch) because of the internal slave there is no way to adjust the clutch over its life. SAC uses a special pressure plate, it will have 3 or 4 springs around the outside of the "fingers" the throwout bearing pushes on. If you have a SAC pressure plate then you need to RESET those springs if you install a new clutch disc. On regular pressure plates the disengage/engage will be at the bottom of pedal travel with new disc, and then slowly over the life of the clutch disc, pedal will go to the top of pedal travel for disengage and engage until clutch starts to slip. You have either a bad master or bad slave, system in not complicated enough for you to be spending this much time on it. In addition to the comments above - I don't know the specs but it seems reasonable the clutch should start releasing at around 1/4 - 1/3 pedal and be fully engaged at somewhere around 1/3 - 3/4 pedal? Also seems you could watch it while someone else pushes the pedal? Just wanted to let everyone know the problem has been resolved, and I only changed two things. One, I put a new slave in. Two, I reset the springs on the pressure plate. (Although they weren't even that far expanded in the slots). So, at the end of the day, my guess is, faulty slave? I did however, notice one thing. When I replaced the slave the first time, after everything was back together, I looked in the inspection hole in the trans to see if I could see leaks. No leaks. However, I was told to look to see if the throwout bearing was up against the pressure plate fingers all the way. I looked, and it was, but I noticed I had to look quite far to the left (to the motor side) to even see the throwout bearing, it almost looked like the fingers were already compressed somewhat, like they were bent Inwards, toward the motor. Now, after Ive got my new slave in, (this time I actually cracked the bleeder when installing it, I didnt on the other one, not sure if that makes a difference) I looked in the inspection hole again, and lo and behold, I was surprised at how easily I could see my throwout bearing, and the clutch fingers, its like they were right vertical with the inspection hole almost, where as before, I had to look into the inspection hole, and to the motor side to see it. Not sure how that couldve happened, but regardless, its all good now and driving like new. Thanks everyone, for taking the time to help me out. Can anyone recommend a place where I can get a skid plate made near Novato CA? Quick Reply: How can this be?